The Cardinal by Henry Morton Robinson - Love, love, love this book! It is a beautiful vocation story during a very interesting historical period. Great themes here both historical and religious and gives a great picture of the international character of the The Church particularly as it relates to the Church in America. It also has fascinating commentary on what it means to be cultured. The Road by Cormac MCarthy- I read this for a book club and didn't like it at all. It was vivid and disturbing with misplaced moral conclusions. Gave me nightmares. The Glass Castle by Jeanette Walls- Also for a book club and did not like it at all. Some people called her childhood "magical" or were fascinated by its eccentricity but I couldn't get past the gross neglect and abuse that she went through as well as the extreme selfishness her parents often showed. Anne Series by LM Montgomery (re-read) - Now we're on to better things :-). This was my post-partum reading. Emily Series by LM Montgomery (re-read) - I enjoy reading these books but have to admit that I think that the ending does not do justice to the characters. It is too rushed, too unexplained, and not well developed. L.M. Montgomery Short Stories - I read about half of them and I found them really charming. She writes characters so well and has such great powers of description! My Antonia by Willa Cather (re-read) - I re-read this after speaking to a young lady about it who didn't think Antonia deserved such a good ending. I am so glad that I did and am still of the opinion that Antonia's ending is fitting. It also has the power of contrasting well with Jim's to show us what is really important in this life. O Pioneers bu Willa Cather (re-read) - stunning and haunting every time. The Song of the Lark by Willa Cather- enjoyable but not as good as other Cathers that I have read. Thea doesn't seem to have the depth that other characters do despite the fact that she is supposed to have great art in her. She just comes off as selfish to me. Anna Karenina by Tolstoy - I am so glad that I finally read this book. What great insight into human nature Tolstoy has! I think that unfortunate as her story is, he writes Anna so well and all that happens to her is fitting. I did find Levin's ending a bit tepid but the book was well worth the read despite that. Letters of a Woman Homesteader by Elinore Pruitt Stewart - thoroughly delightful, fast, fun read. Emma by Jane Austen- This may be my favorite Austen novel. I wrote a little bit about it here. Persuasion by Jane Austen - I am very glad I read it. I wasn't as attached to these characters so I really enjoyed taking a more objective look at her writing craft here. Genius! Pride & Prejudice (re-read) by Jane Austen- I love every page. I was laid up with an injury so I read it in about a day and half. Taking it in all at once helped me to see into the characters more than I ever have before. Georgiana's Diary by Anna Elliot- I wish I hadn't read this, it was just awful. She takes modern ideas and forces them on Austen characters. She is also not accurate to the fates of the characters as Jane has it at the end of P&P. I had to go back and re-read the last few chapters of P&P to get over how bad this was! Beautiful Babies - Great traditional foods book, well researched, easy to read. A must for pregnant, nursing, and otherwise mommies. This book is very well written and easy to follow (more so than Nourishing Traditions for me). She also talks practically about what to make a priority when you are on a budget. The Nourishing Traditions Book of Baby and Child Care by Sally Fallon Morell- This is also an invaluable source of information though not as easy to get through. Fermented by Jill Ciciarelli- just got this for Christmas from my dear brother and I love it! True Devotion to the Blessed Virgin by St. Marie Louis DeMontfort - My husband and I read this together (he reads, I knit) and we are almost finished. We are growing so much from reading it. The Story of a Family by Stephane Joseph Piat- My husband and I paused reading this to read true devotion. We have benefited so much from seeing into the family life of St. Therese as we raise our own little family. The Presence of God by Fr. Anselm Moynihan, OP (re-read) - I try to return to this book often. It is short but full of wonderful spiritual advice. The first chapter is particularly breath taking and I think I read just that many times a year to help me remember to slow down. Great read of a busy mom of littles. Year with the Trapp Family - Love this as a resource for ideas for celebrating the liturgical year. Feast! by Daniel and Haley Stewart - The reflections here bore great fruit in our family's advent and I love the recipes! I am looking forward to going through the rest of the year with this book. The Liturgical Year - These are the books that St. Therese's family used and we just got them. Love them so far! The First Chapter Book I Read to my Daughter!!! Winnie the Pooh Stories by A A Milne - One of my childhood favorites. My daughter and I loved reading this together. I'm just head over heals about it. hundreds of children's books. I truly enjoy reading them and am mildly obsessed with researching them. We are all bookworms here! 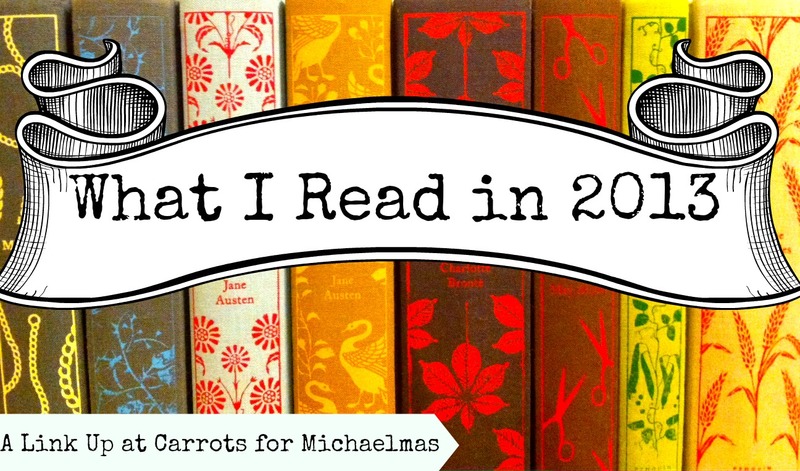 I really enjoyed all of the re-reads that I did this year. As you can see I often read several works by an author, and I really enjoyed thinking about and studying their works as a whole. Being Catholic (I converted 5.5 years ago) has put a whole new perspective on what I read. It makes me better able to analyze and enjoy good literature. I'm looking forward to 2014's reads already!